Here is my version! She has a blackbird friend that sits on her shoulder while she walks through the garden. 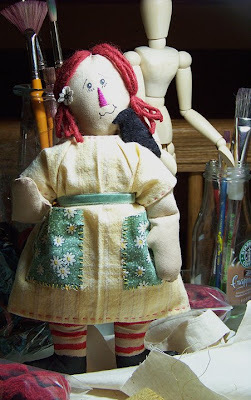 I can’t wait to hop around to everyone’s blogs to see their rag dolls. Surely this is a fun way to welcome spring in! What a cutie your Annie is! I posted mine, but I see you don’t have me listed as a participant. I hope you’ll stop by to see my dolly. Thanks for hosting!! Oh my goodness she is adorable!!!! I love her!! I just love that sweet sweet little face. And the flower in her hair is so darn cute!!! Very sweet Annie…like her outfit! Where is my link at the right??? Help!! oh she's so lovely! bird charmer & floral pockets to collect all those lovely spring ephemera! with a velvet ribboned belt! she is someone you really want to walk around the garden with, welcoming in the spring! beautiful photo as well! & Thank You! this has been such a strain! but a pleasant one 🙂 !!! on my blog…thanks, maybe I can catch the next one earlier…. Love your Annie doll. Thanks for the challenge. I don’t seem to be on your Spring doll list either! Emily, I know I chose to do crochet, and I am very happy with how my own dolly came out, but YOUR dolly and the others in your event have truly inspired me to try a new style of dolly! I have plenty of projects always going, but when I can… I WILL!! Actually, I AM signed up for the even at Aunt Pitty Pat’s, so it looks like that will be my opportunity to do that!! 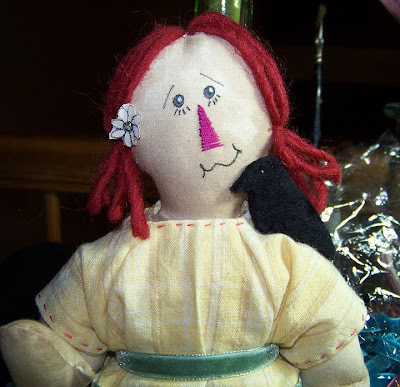 I LOVE your doll, and LOVE that little bird on her shoulder! Thanks again for the FUN!!! I finally have mine posted. 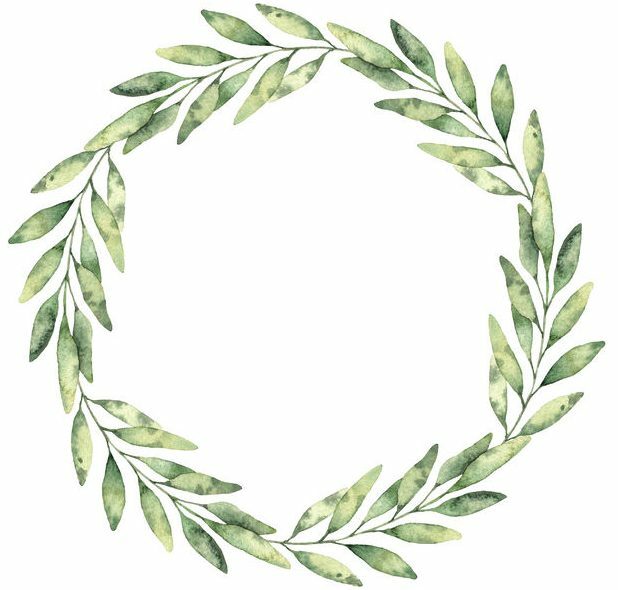 Please check it out and let me know what you think. Everyone had done such a wonderful job! sorry i didn’t get to participate, i had my intravenous therapy and its aftermath, am feeling better now. yours is adorable, so cute. I am off now to see everyone else’s.